Fionnuala grew up and went to school in Naas in County Kildare, Ireland- surrounded by a musical family that ignited her passion for music at an early age. She started to play the violin at the age of eight, and at fifteen she moved to Dublin to study music. She graduated with honours from Trinity College in Dublin, and the College of Music, and was later employed by the RTE Concert Orchestra, where she was a member for ten years. In addition to the classical symphonic and operatic repertoire, Fionnuala possessed a much wider musical interest. This is evident in the eclectic body of artists and projects she has been involved with, including The Chieftains, Sinead O'Connor, Van Morrison, Chris de Burgh, Bono and Wet Wet Wet. With the Irish Film Orchestra she's also recorded several Hollywood film scores, such as "The River Runs Wild", "A room with a view" and "The Mask". That same wide interest in music led her to conceive, write and present her own music series for children on Irish national TV - all this leading up to her fated meeting with Rolf Lovland and the founding of Secret Garden in 1994. Onstage, she enchants audiences throughout the world, through her musical intensity and soulful performances. 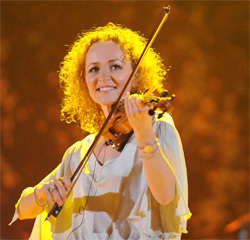 In Secret Garden's music, her unique violin virtuosity provides the heartstrings, voice and wings for Lovland’s compositions. She performs on an English John Edward Betts violin from 1790, with a Hill bow, both on stage and in the studio.